If you read my comments from PhotoPlus Expo 2017, you could have guessed that I would buy the Ricoh Theta V. It delivers on all the promises made by the terrible Nikon Keymaster 360! The image quality is great; it is compact and easy to use; and, the Android App actually works! It’s one flaw is the lack of image stabilization. If you plan on walking around, you will need some kind of gimbal to smooth out the bumps. 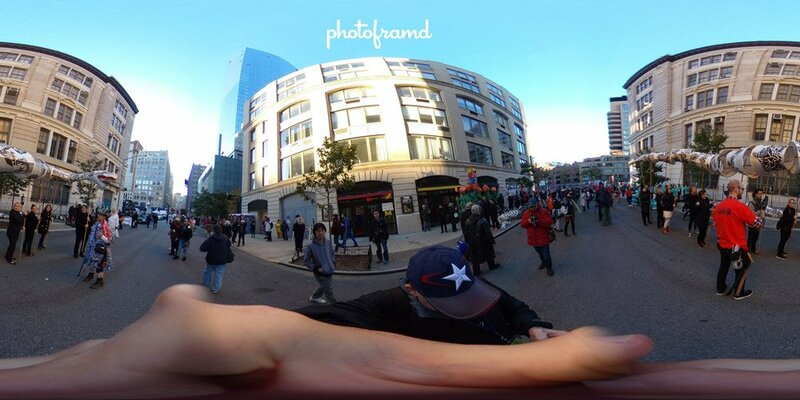 I shot the above video in between photos during the NYC Village Halloween Parade. It’s impressive. Ricoh has a winner! I did have problems with the Ricoh desktop software. You need to run the Theta video through the Ricoh Basic App to convert the video to a format that can be editing in Premiere Pro. I installed it on my Windows 10 Workstation and it would hang in the middle of converting the video. It did give me the option to install for all users or just me, and I probably should have installed for ALL. I uninstalled it and reinstalled it and it would still hang. I tried calling the Ricoh Support line and they were not very helpful. So, I installed it on a different PC and it worked fine. The Basic App actually converts the video very quickly. You can edit in Premiere Pro just like any other video, just make sure that you match the video output settings and that it is flagged for VR. (If not, you can develop black holes at both the North and South poles.) Once complete, you will need to add back the 360 Metadata. Follow this Google article. I used the Spatial Media Metadata Injector for Windows. Warning – Norton flags this as malware and will remove it. The author claims it is a false positive and is working to have it corrected. Don’t forget to look through my Photo Gallery – I have 170 photos from the NYC Village Halloween Parade 2017!